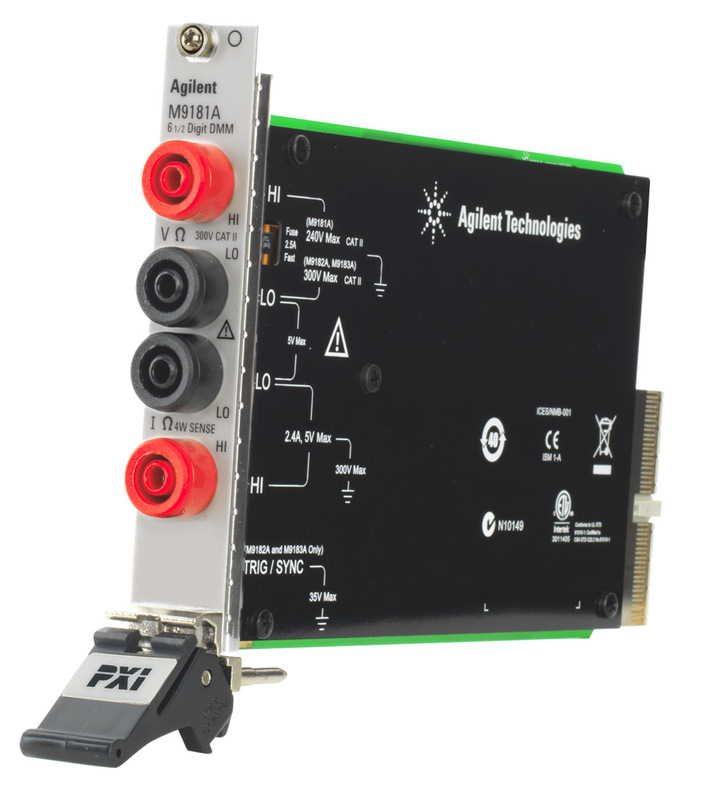 Agilent Technologies Inc. (NYSE: A) today introduced the M9181A digital multimeter to complement its growing family of PXI DMMs. This new 61/2 digit PXI DMM offers basic measurement features, without compromising resolution and reliability, at a competitive price point. With the M9181A, test engineers in aerospace/defense, electronic manufacturing, and automotive industries now have an economical PXI DMM alternative. The M9181A 61/2 digit PXI DMM measures common parameters such as DCV, DCI, ACV, ACI, and two- and four-wire resistance. The DMM offers 90-parts-per-million basic DCV and 800-parts-per-million basic ACV one-year accuracies and inputs up to 200 volts. The M9181A DMM is compatible with PXI, PXI Hybrid and CompactPCI(r) instrument mainframes, including Agilent's PXI chassis & accessories. "The M9181A PXI DMM is a complementary member to our high-speed family of PXI DMMs providing a lower cost solution for basic measurements," said Gary Whitman, vice president and general manager of Agilent's System Products Division. "Like our market-leading family of bench and system DMMs, this new PXI DMM delivers trustworthy results that today's test industry demands." Each PXI DMM ships with a full suite of software to enable easy system integration regardless of what software environment end-users have on their PCs. An intuitive software front panel enables DMM setup, measurement and system troubleshooting without programming. The DMMs include IVI-COM, IVI-C and LabVIEW G-drivers that are compatible with C++, Visual Basic, LabVIEW, and many other PC software environments. Pricing for the Agilent M9181A 61/2 digit, basic features DMM starts at $995. The instrument can be ordered now, with shipments beginning in October. For more information on Agilent's new M9181A PXI DMM, go to www.agilent.com/find/M9181A. For more information on Agilent's family of PXI DMMs, go to www.agilent.com/find/PXI-DMM. For more information on Agilent's entire family of PXI products, go to www.agilent.com/find/PXI. For high-resolution product images, go to www.agilent.com/find/PXI-DMM_images. Agilent offers a complete lineup of PXI and AXIe products, including digitizers, arbitrary waveform generators, digitizing oscilloscopes, digital multimeters and a range of switches. Additional information about Agilent's modular test solutions is available at www.agilent.com/find/modular. PCI eXtensions for Instrumentation (PXI) is a modular instrumentation platform designed for test, measurement and automation applications that require high performance in a small, rugged, industrial form-factor. With PXI, users may select over 1,500 modules from over 70 vendors and easily integrate them into a single PXI system. An industry standard, PXI is managed by the PXI System Alliance, an open consortium. Information about the PXI System Alliance is available at www.pxisa.org. It would be great if you could share and compare your experience in using both of these boards. Thanks for the comment!